banner displays. The web site averages over 2,000 per event. Interact with over 400 IT and Facilities professionals who will apply your insights to meet their daily technology and facilities challenges. Educational sessions may be conducted in either a lecture (single presenter) or a panel (multiple presenters) format. 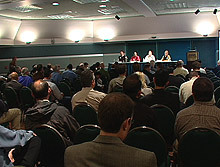 If the panel format is selected, the panel should be limited to a maximum of four participants, including the moderator. The instructional methods used during the session should provide opportunities for participants to be actively involved and interact with the material, presenters, as well as other participants, where appropriate. All presenters must provide clear and concise written statements of intended learning outcomes or objectives for each session. These statements should reflect what the participants will achieve by the end of this session. The presentation should include handouts for participants to supplement the learning experience. The presenter should submit presentation handouts by Friday, December 19, 2008 for TELADATA’s approval. TELADATA will provide each room with a laptop, head table, podium and microphone. The audience seating will be arranged in a theater fashion (multiple rows of chairs). Any additional audiovisual (AV) requirements should be acknowledged in the 2009 Presentation form. All presenters and panelists are expected to demonstrate high standards of professional conduct. Discrimination against participants on the basis of gender, age, socioeconomic or ethnic background, sexual orientation, or disability will not be tolerated. You can submit your presentation via email to Maricel Cerruti at mcerruti@teladata.com. An individual may submit a maximum of three (3) proposals for consideration. Include the learning objectives that the participants will accomplish by the end of the session. Identify the presenter/panelist, including information detaining their background and qualifications relevant to the presentation. Disclose any commercial interest that the presenter or any of the panelists may have in any product, instrument, devise, service or materials discussed during the proposed session. Include a brief biography (500 word) for the presenter that could be used in the promotional materials. Provide samples of handouts, case studies or any other materials that will be made available to the participants. Identify any audiovisual or set up requirements for the educational session. Submission of a presentation does not guarantee inclusion in the Convention. presentation proposals will also be reviewed by TELADATA. Deadline for submission of all presentations is 5:00pm PST Friday, October 31, 2008. Any submissions received after this time will be considered at the sole discretion of TELADATA. Those who submitted a presentation will be notified whether or not their presentation was accepted by e-mail on or before 5:00pm PST Friday, November 21, 2008. If you have a great topic in mind, but don’t feel you meet the requirements to speak about it, let us know. Gather your thoughts, including important details and e-mail them to Maricel Cerruti, Director of Marketing and Business Development at mcerruti@teladata.com. If you have any questions concerning the 2009 Call for Presenters or the Technology Convergence Conference, please contact Maricel Cerruti at mcerruti@teladata.com.